Anyone who knows me is aware that I’ve become rather obsessed with Sutton Foster over the last few months. Okay, well, not obsessed with Foster, really. Actually, I’ve become obsessed with her talent. I’ve been listening to her music on repeat for weeks now. I did a marathon viewing of Bunheads. (Can someone give me a reason just why was that show cancelled? I can’t figure it out.) YouTube has been fabulous for allowing me to watch the performance of “Anything Goes” at the Tony’s over and over and over. 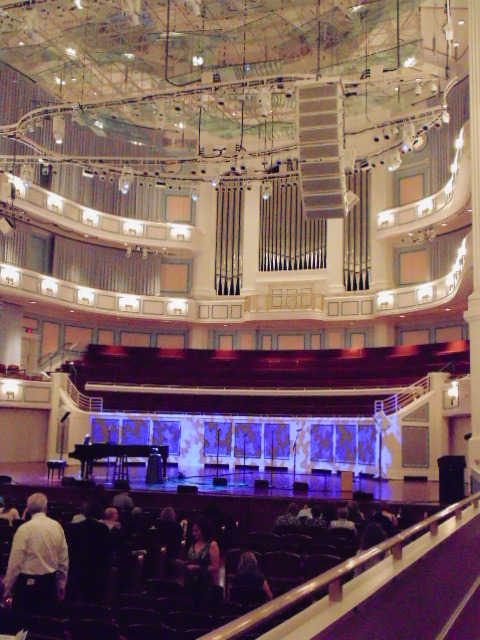 So, when I learned that Foster would be performing in Carmel, Indiana – a mere 3-hour drive away – I immediately purchased a ticket. I’m so very glad I did. The performance was presented by the Actors Theatre of Indiana (ATI). Admittedly, I’d not heard of this performing arts company (the resident professional theatre company in Carmel, IN). Then again, I don’t live in Indiana, nor have I really been involved in the theatre world for a number of years. But, I’m always up for a new experience. And what an experience this was! The performance was held at The Palladium at the Center for the Performing Arts on October 5, 2013. What a beautiful venue this is! There doesn’t seem to be a bad seat in the house. Speaking of the seats, they are very nicely appointed. The main orchestra floor seating is pretty standard, but the seats are well kept and appear roomy and comfortable. The box seats – where I was sitting – were even nicer. It was nice to sit in my own chair with my own arm rests. The acoustics are really fantastic. It has a good-sized stage that lends lends itself to various types of performances. I can easily see this space being used for various concerts, choral performances, plays, lectures, etc. With any luck, I’ll have the opportunity to see many, varied performances at The Palladium. Overall, it’s just a really great performance space. Quite impressively, the lights dimmed right on time. The founders of ATI – Don Farrell, Judy Fitzgerald, and Cynthia Collins – came on stage to welcome everyone to the performance. I must confess that I usually find this part to be rather boring. But not on this night. The founders were charming and personable. Their introduction was a performance of its own. After introducing some of the honored guests in the audience (the Mayor of Carmel, some Ball State professors), sponsors, and board members, the founders provided a brief history of ATI and mentioned some of the upcoming performances. Ultimately, however, it was time to start the show. Foster didn’t waste time and got right to singing. I could give a rundown of the songs, but I’m probably boring you, Dear Reader, quite enough already. Instead, I’ll hit the highlights and overall impressions. The song selection was nicely varied. Foster and Rafter pulled together a very nice set of songs to showcase Foster’s amazing range – from humorous ditties, to bluesy jazz standards to melodic love songs to belting show-stoppers. Here are some that really stood out for me. “Air Conditioner” (“All you need’s an air conditioner and you’re the man for me”) showcased Foster’s talent for bringing out the humor in the lyrics. “For the Life of Me/NYC/Astonishing” is a beautifully arranged medley of songs from Thoroughly Modern Millie, Annie, and Little Women (all Broadway productions in which Foster performed) that Foster sings masterfully. “My Heart was Set on You” – which is one of my favorites – is a bittersweet song that Foster delivers right from the heart. “On My Own” was one of the real highlights for the evening – I’d only ever heard this via a grainy YouTube video, so hearing it live was really a thrill for me. Foster’s delivery was so very spot on. “The Lies of Handsome Men” is a song that I’d not heard before (not being familiar with jazz), but one that I instantly loved. “Anything Goes” – goodness, this woman can belt out a song! This was, perhaps, a perfect encore song for Foster. What I really loved about the evening is Foster’s performance style. She really seems like a “no frills” kind of gal. Who needs a full orchestra when she has Michael Rafter at the piano and that amazing voice? Why bother with showy, bedazzled “costumes” when a simple shift dress displays her easy grace and elegance? Having performed on various stages, I’m aware of what happens when stage lighting is focused on you – basically, you can’t see past the first few rows. This didn’t stop Foster, however, from encompassing the entire audience in her gaze. Whether she could actually see past the lights into the back rows and box seats or not, it felt as if Foster was making direct eye contact with you – and only you. In doing so, this concert performance became much more intimate and personal. She’d smile at the audience as if sharing a secret or letting someone in on an inside joke. The combination of a beautiful performance space with a beautiful performer made this, for me, a perfect evening of entertainment. If you have the opportunity to see Foster perform in or near your home town, don’t hesitate.